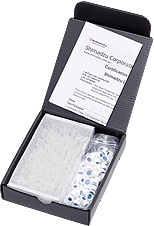 Shimadzu LabTotal Vials reduce ghost peaks originating from a septum especially when using mass spectrometer, or when doing low level analysis with sensitivity detectors. This feature shortens the time needed for sample preparation and reduces human error. LabTotal Vials are designed such that the corners of the bottom of the vial interior can be reached by inserting a 100 μL scale micropipette tip obliquely, which increases the ease of use when inserting and retrieving samples. Marking labels allow users to label the vials for easy identification. This vial can be used as a vial for high-sensitivity analysis in GC and GC/MS. 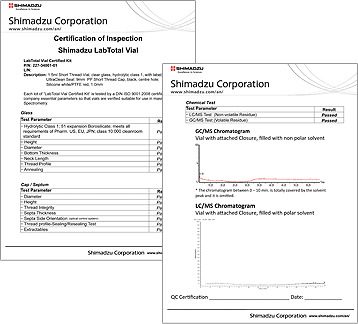 The Quality Certificate confirms absence of elution components from the vial in random inspections using GC/MS and LC/MS. Therefore, this product can be used with confidence, with no concern for ghost peaks originating from the vial.